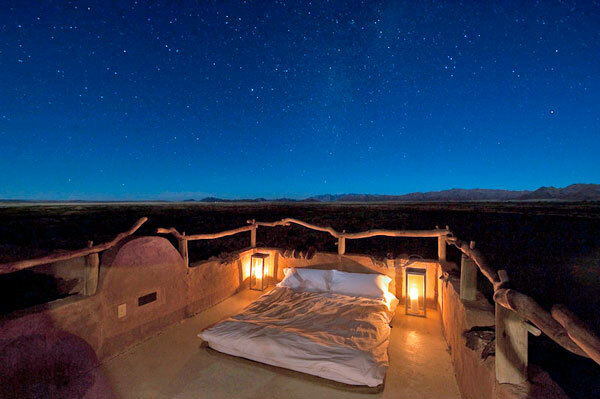 For a true sense of being out in the untamed African wilderness – spend a night or two under the stars. You can immerse yourself in the sights and sounds of the bush: the calls of hyenas and jackals, the chatter of birds at dusk and again at dawn, the spectacular sky with the Southern Cross constellation glittering above you and of course the glorious African sunset and sunrise. Are star beds for you? There are two types of star beds. The first option is a separate place that you go to enjoy a sleep-out in the bush. You head off to the sleep-out platform in the late afternoon on foot or by vehicle. At some sleep-outs it is just one couple, either alone or with a game scout nearby. At other camps, it is offered to a group so that it is quite a festive atmosphere, though less romantic. The second, much closer to home, option is when your suite has some sort of an outdoor ‘sala’ (sleeping area) where you can sleep under the stars but still within the confines of your accommodation – usually a terrace on the roof. 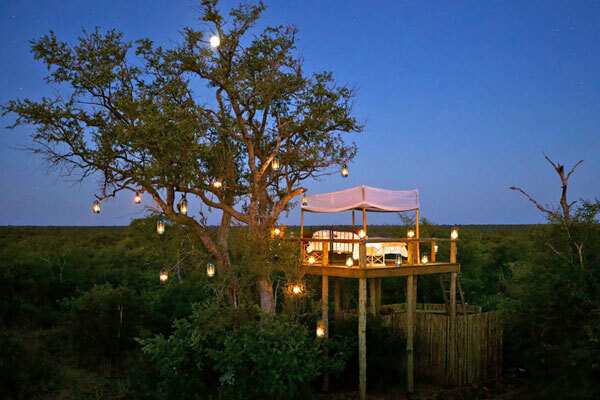 These ten sleep out decks or ‘star beds’ are the ultimate bush bedrooms. They are luxurious, with crisp white bed linen and a down duvet; a bathroom with a loo and possibly a shower, and a radio for contacting the lodge should you need room service. With Kilimanjaro a constant backdrop, the views from Ol Donyo lodge, a member of both the prestigious Relais & Chateaux group and National Geographic’s Unique Lodges of the World, are grand and breath taking. 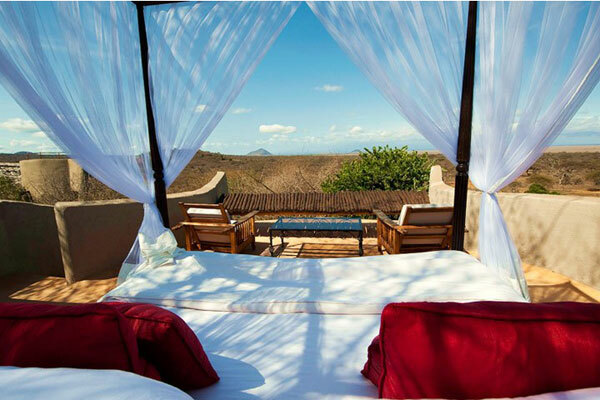 Yet the seclusion amid the foothills of the Chyulu Hills presents guests with a truly intimate experience, a rare opportunity to be immersed in the essence of the Kenyan wilderness. Each of the ten private cottages here has a roof terrace where star beds can be set up, allowing guests the thrill of sleeping in style under a canopy of endless stars. Among the safari activities at this beautiful lodge are walking safaris, day and night wildlife drives, horse riding safaris and mountain bike excursions. Poised on a rocky kopje, the Loisaba star beds command sweeping views over an undulating valley and a permanent waterhole, frequented by resident wildlife. Rising early to watch sunrise from your star bed with a comforting hot drink, the day ahead promises adventure, with a myriad of activities including riding safaris and camel safaris. A day of fun is rounded off with drinks by the log fire in the star beds lounge, exchanging tall tales of the African bush, with the conversation continuing over a delicious shared dinner. 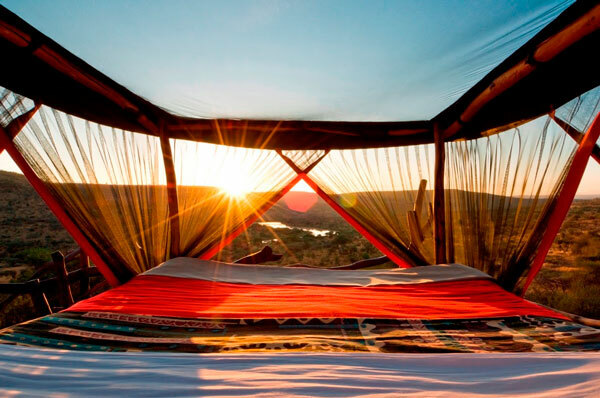 At Little Kulala you can sleep in your glass walled and thatched roof chalet or, for more adventure, choose to head upstairs to your private rooftop bed where you can count shooting stars as they streak across the sky. The Namib Desert is classed as a dark sky reserve and the stars are incredibly bright here. Head out for scenic drives and walks to the beautiful Sossusvlei dunes and Namib-Nauklauft mountains, and view desert adapted wildlife. Cool off with a dip in your private plunge pool. 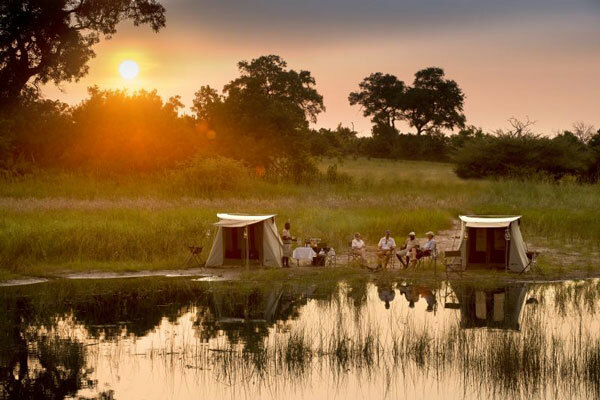 One of the most luxurious camps in the area, Abu Camp is renowned for its resident herd of African elephants. Lodging here gives guests a unique opportunity to walk with these gentle giants or sleep out on a deck above the elephant boma. 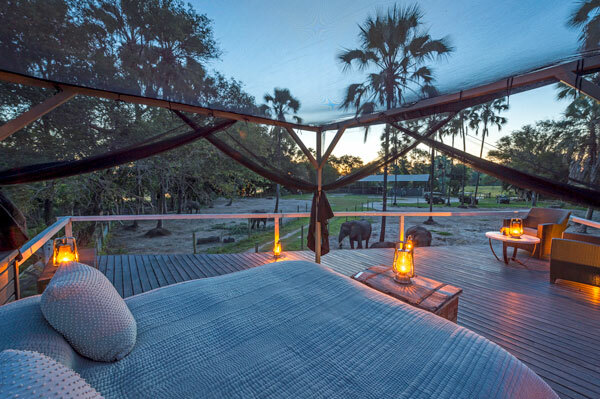 You’ll be amazed as you are lulled to sleep by the gentle snores of elephants in the enclosure below. In addition to spending time with the elephants, walking or sleeping with them, guests can also go for game drives, and mokoro (dug out canoe) trips if water levels permit. 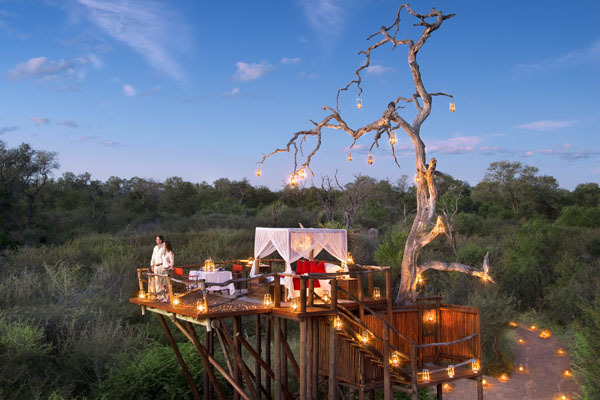 Chalkeys’s Treehouse is built around an ancient leadwood tree and the high platform is the perfect place to enjoy a sundowner and picnic dinner before settling down to a romantic night under the stars. Once Guy Chalkley’s own game-watching tower, it is ideal for spotting nocturnal wildlife. At Return To The Wild guests venture out from the remotest bush camp on foot mid afternoon and can sleep for a night or two under the stars in Zambia’s renowned South Luangwa National Park with a mossie net tent, a guide and scout for company and camp fires to ward off nocturnal visitors, miles from civilisation. Just six guests can enjoy this amazing experience and join in by finding a spot to camp, make the camp fire for a game rangers dinner, which they help cook themselves. 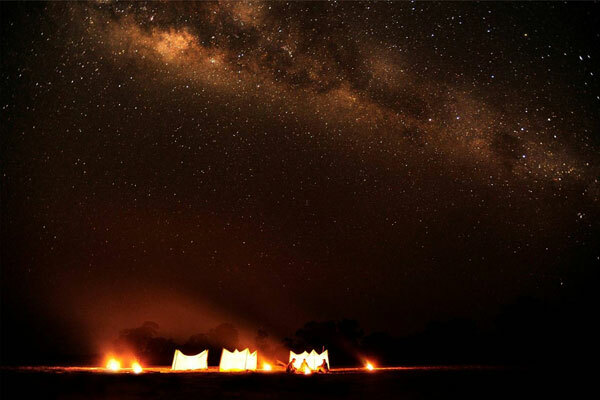 Having shared adventure stories around the fire, – sleep out under the magnificent Zambian sky whilst the guide and scout keep a watch until morning. This sleep out is only for the most adventurous of spirit and the wildest experience in the South Luangwa. 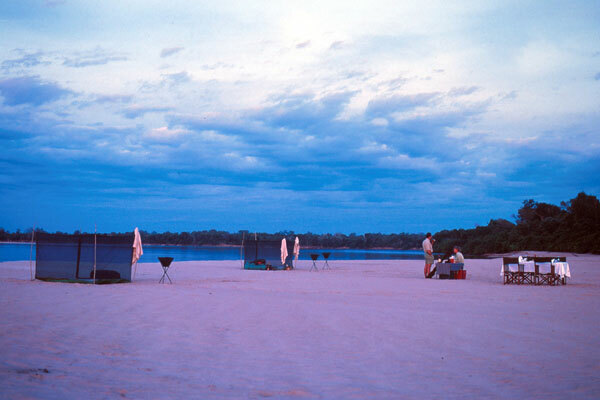 Set above a wide, sandy bend in the Rufiji River, Sand Rivers Selous offers guests, games drives, boat trips up the river and walking safaris. Sand Rivers runs the popular fly-camping trips, whereby a couple of guests sleep out on a dry riverbed with their guide. The evening meal is cooked outside complete with table linen, crystal glasses and fine food. These sleep outs are offered for one or two night as part of a longer lodge stay. Nkwichi Lodge offers the ultimate Robinson Crusoe experience. 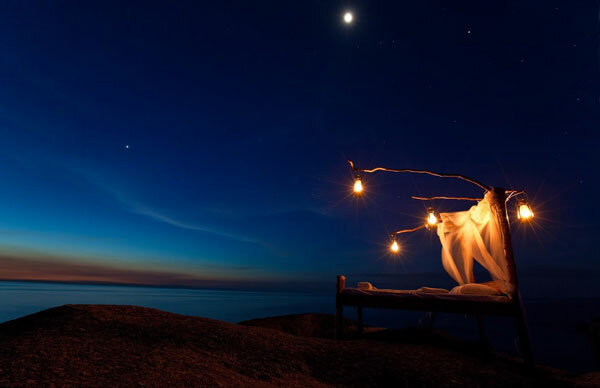 This star bed is not in a game reserve but on the Mozambique shore of Lake Malawi. After sunset you are ferried to the star bed which is on a private little island 10 minutes from the lodge. Your luxurious four-poster bed is on rocks overlooking the aptly named Lake of Stars. After a delicious supper you are left alone to enjoy the evening star-lit skies, and to be serenaded to sleep by the gentle ebb and flow of the lake. In the morning, you are collected and enjoy an amazing bush breakfast. The lodge offers a wide range of activities, such as canoeing on the lake or local rivers, guided bush walks and trekking looking for birds and wildlife, snorkelling, kite flying, surfing and visits to local community projects. 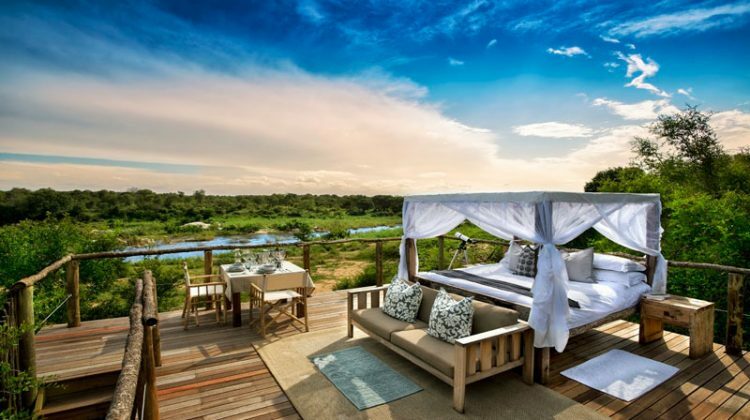 Tanda Tula Safari Lodge offers sleepouts at its elevated Machaton Hide in the dry season from May to September. The hide is equipped with oil lanterns, camper bed with cosy duvets and hot water bottles, a game viewing spotlight to help you spot nocturnal visitors to the waterhole and a two-way radio. Timbavati is home to a variety of game including the Big 5 as well as wild dog and numerous bird species. Game viewing is by vehicle or on foot with an armed ranger and the skilled guides here are among the best. Two night walking safaris in the company of a ranger and tracker can also be arranged. 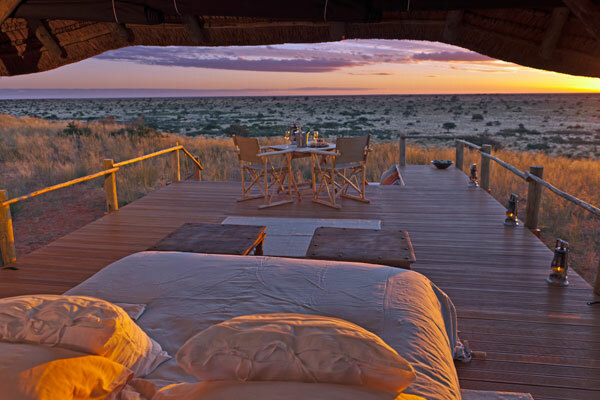 A wonderfully luxurious option is the Malori Sleepout platform at Tswalu Game Reserve, where guests can sleep under the desert stars in magnificent style and comfort. With its large deck and stunning panoramic views over the vast game reserve, it offers those who opt to sleep here the chance to experience at close quarters the nocturnal sounds of the bush. About five miles from the main lodge, The Malori has comfortable, cosy beds, shower facilities and a thatched roof towards the back of the platform to provide shelter if required. Dinner is prepared while the guests enjoy sun-downers and the amazing Kalahari sunsets, and the following morning they can ride, walk or drive back to the lodge. Other activities at Tswalu include guided walks across the stunning, silent red dunes and game drives in open-sided safari vehicles, stopping at the scenic spots to enjoy an impressive sunset or splendid bush dinner. Bird-watching, star-gazing, rhino tracking and exciting visits to the habituated meerkat dens of Tswalu are just some of the activities on offer. Optional horseback trails, with a qualified guide, enable guests to become at one with nature and to experience close encounters with wildlife.